It has been ten years since 2004’s Shaun of the Dead, the breakaway hit that launched the mainstream careers of both Simon Pegg and director Edgar Wright. Prior to that film the two had worked (along with the delightful Jessica Hynes) on the British sitcom Spaced – and, if you have not had the chance to see it, do so with all haste; it is one of the funniest and most inventive television shows of our generation, a launchpad for pop culture commentary and plain old witty writing. Sadly, Jessica Hynes did not accompany the duo to mainstream fame and fortune, copping only a petite cameo in Shaun before dropping from the spotlight. But the two, along with co-star Nick Frost, went on to create what is still my favorite collaboration in the Blood & Cornetto trilogy, the action movie pastiche Hot Fuzz. 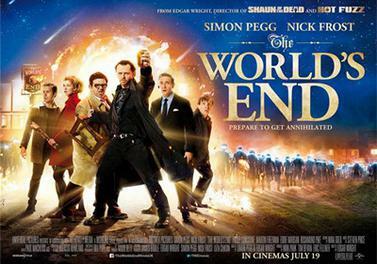 I say my favorite but their latest, this year’s The World’s End, is hot on its fuzzy heels. Simultaneously their most grounded and their most off-the-wall production to date, The World’s End plays with the same gags as the last two films in this thematic trilogy, acting as a quasi-mature conclusion to what has been a labor of fun and irreverence all along. The film centers on the burnt out Gary King (Pegg), once a troublemaker of the first order and all-around-groovy-guy now pushing 40 and still wearing the same clothes, driving the same dying car, still partying like its 1990 and dying his hair a primordial black. Wishing to complete the “golden mile,” a 12-stop pub crawl in his home town, he badgers his old best mates to join him on this irresponsible odyssey. Each is now a career professional in his own right, with responsibilities, children, spouses and ex-spouses, but by hook and by crook Gary convinces them to join him. Once back however they find that things are not quite what they seem. Everything has been “Starbucksed,” cleaned up, their supposed legacy erased. But not everything is what it appears to be. The trailers have spoiled the sci-fi surprises in store, understandably so. Five British dudes drinking pints in their old hometown is not thrilling material on its own. So you won’t be surprised when the blue blood hits the fan. However, you may be surprised that it doesn’t kick in until about halfway through the movie. The first half, what we can consider the more talky half, is all about the disconnect between living wild and free twenty years after it’s not cool anymore. That half is very funny. Once we get to the second half – the spacey blue blood half – the story does not stop. The disconnect between Pegg’s floundering manchild and a world thrown into chaos only escalates, and this half is even funnier. The World’s End, like Shaun of the Dead and Hot Fuzz before it, is a solid buddy comedy that ticks off all the essentials: Snappy direction, bouncy banter, laugh out loud jokes, great chemistry and rousing fight scenes. It is also loaded with seemingly throwaway lines that are visually and cleverly called back to throughout the film. Nick Frost plays Andy, Gary’s once best friend and now embittered salaryman. He gives a performance in this film that is unlike anything he’s played in Spaced or Wright’s former films, viciously adult and firing deadpan criticisms at Gary that hit every single time. Their chemistry is still excellent and more than just the reverse of Shaun and Fuzz’s straight man/silly man dynamic. Pegg’s Gary is a legitimately flawed individual, a man with no illusions about what he is now: A decrepit has-been still buzzing from his long bygone glory days. His mission to drink in each of the 12 bars is played for laughs but gradually twisted on its head. He is pathological, not well, somehow still alive. The confrontations throughout the night come to a head not with the strangers among them but with himself. And as for how that confrontation ends, I will not spoil it. I will say only that the final fight, the penultimate scene, between Pegg, his posse, and their adversaries, ends in a relentless screed about mankind’s place in the universe that is shockingly, preposterously and drunkenly hilarious. The World’s End hits on some very true and stupid things about all of us. It treats the rising drunkenness of its protagonists appropriately and it is a sterling example of how to use an all-star ensemble. What each of the films in the Blood & Cornetto trilogy has going for it is a dedication to detail, character and story. The fun and humor emerge naturally from that cohesive recipe. I doubt this is the last time Pegg, Frost and Wright will work together but we can consider this finale a comedic and emotional success. Having not seen a trailer, I have no idea what goopy blue blood you speak of is, but if it can rival Hot Fuzz, I’m in. Really it’s sort of just a big middle finger and raspberry to authority – rebellion for rebellion’s sake. For better or worse, we get to decide for ourselves. It might land us back in the Dark Ages but maybe that’s where we belong(? ).